Saying "Trance" is a mind trip is an understatement. In essence, and seemingly intentional, the film is extremely convoluted. In fact, most of the time, you are not even sure if what you are seeing is reality or just a character's dream due to hypnotism. And that is probably why you would love "Trance". The preposterous plot and outlandish and seemingly endless twists become forgivable once you experience its flashy and trippy feel - a thing that clearly sets it apart from others. Most would have a hard time understanding "Trance" (and even appreciate it in fact) but we could definitely see its niche appeal. Simon (James McAvoy), a fine art auctioneer, teams up with a criminal gang to steal a work of art worth millions of dollars. Unfortunately, after suffering a blow to the head during the heist he wakes to discover that he has no memory of where he has hidden the extremely valuable painting. When physical threats and torture fail to produce answers, the gang’s leader Franck (Vincent Cassel) hires hypnotherapist Elizabeth Lamb (Rosario Dawson) to delve into the darkest recesses of Simon’s psyche. As she digs deeper into his broken subconscious, the stakes become much higher and the boundaries between desire, reality and hypnotic suggestion begin to blur and disappear. From the get-go, there is a certain confusion with what's happening on the big screen (you are not even sure if Simon is part of the heist or not). "Trance" revels on the idea of uncertainty and not knowing what's actually going on. It does work initially as we found ourselves glued to the film. Unfortunately, the overall plot was a big disappointment. 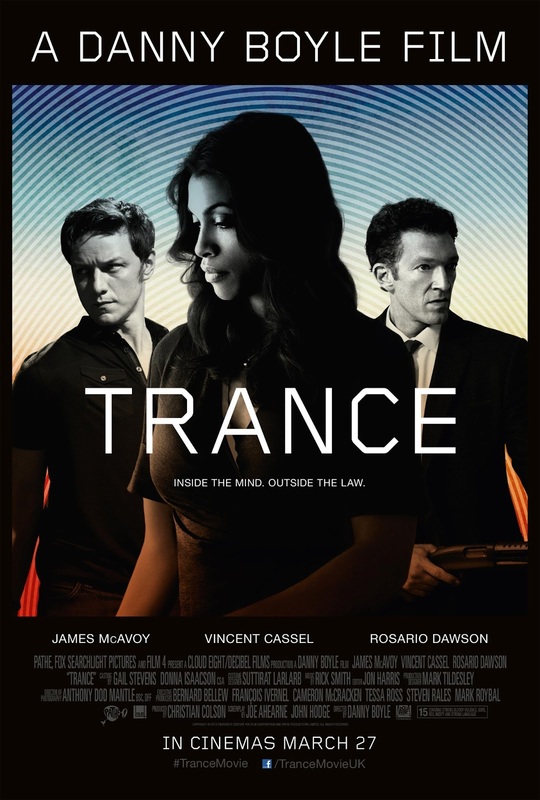 We could live with a straightforward film but what "Trance" presents is bordering preposterous. Without spoiling much though, the film's central character will be a definite shocker and not one we expected to say the least. Visually, the film is astoundingly beautiful. From reality to the dreams, cinematography is top notch and the thing we most remember about "Trance". In the end, "Trance" gives off a feeling that you have been hustled badly. The basic premise could have been better developed with a deeper and more believable story.